And we can totally relate. A 5:30am wake-up call? A strictly regimented routine? Cabinets full of department store beauty buys? How thrilled would you be to hear that none of these make an appearance in the morning of today’s subject, Lisa Hayim? Instead, “registered dietician with a Master’s in Nutrition and Exercise Physiology from Columbia” is more like it. And while Lisa lives a mostly non-toxic, ethically driven lifestyle, what she wants for her nutrition clients is quite simple: to stress less. Combine that mantra with an admitted weakness for the snooze button and a totally relatable (read: hilarious) personality, it’s easy to see why The Well Necessities has quickly became one of our favorite destinations for all things nutrition, and one of our favorite Instagram follows. 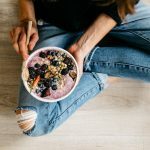 Read on for a refreshing glimpse into what the morning of this dietician looks like, including but not limited to, a killer non-dairy creamer recipe, the comfy clothing line Lisa can’t live without, and the first “meditation room” we’ve ever had on Camille Styles. Night Owl! I so badly want to be an early bird but my brain loves the evening. It makes sleep difficult because my brain gets extra creative right when I’m supposed to be going to bed. 8 hours is ideal. It varies. Most people assume I’m an early riser, but the truth is, I try to get as much sleep as I can depending on my responsibilities that day. I used to use the alarm on my phone, but I’m now using Google Home so that touching my phone isn’t the first thing I do. I now work from home, so things are very different! I like to drink my water and usually head straight to the gym. After the gym, I start to get ready for a day of clients, phone meetings, and whatever else is on my to-do. “Getting ready” isn’t what it used to be when I had an office to get to. A tiny bit of makeup, get dressed and its time to develop a new recipe, write a new blog post, or create a video for my Youtube channel! You’ve just woken up. Quick, what’s the first thing you do? Water! I drink A LOT of water. 16 oz (next to my bed) is the first thing to wake me up, letting my digestive system know we’re back in business. I use palo santo every night so I probably wake up smelling like it. Other than that, I rarely wear perfume anymore. At this point I’m more likely to roll on some essential oils since what we spray on us goes directly into our blood stream. Not something I used to think about when picking up a designer scent at Bloomingdales. Yes. We are totally on the palo santo train. What are some of your favorite products at the moment? Puracy Nontoxic Body Wash! Inexpensive and on Amazon. I love the smell too. I’m also very into my new under eye concealer – it’s got a nice shine that brightens and lifts. It’s vegan from Tarte. We’re such fans of The Well Necessities. For new readers, what inspired it? And what can they expect to find there? TWN has been a beautiful evolution from where I started to where I am now. I began blogging when I was in graduate school at Columbia University for Nutrition and Exercise Physiology. It was my place to share all the science-based facts I was learning, and the easy plant-based recipes I was making (always 5 ingredients or less.) I didn’t know then that anyone else would want to read it or that it could be a business one day. After becoming a dietitian, TWN became a place for me to share my personal experiences, my own unique philosophies on nutrition, write thought provoking articles, and still – share 5-ingredient recipes! What does breakfast look like for a dietician? Totally depends. My morning mood for food can vary greatly so I take it day by day. Coffee or Dandelion tea made in a French press is my go-to drink. I usually add in some adaptogens too, plus nondairy creamer. Right now I’m making my own creamer, which is a can of full fat coconut milk, plus vanilla extra and a pinch of sea-salt. Inspired by my best friend and colleague Abby K Cannon who lives a zero waste lifestyle. I love it because it’s cheaper, and has better-for-you ingredients than the typical nondairy creamers I was buying (read: addicted to) previously. Yup, and that varies too, but I like to walk or do the stair master, use some booty bands to strengthen my glutes for hip stability, and some upper body too. Usually 45 minutes to an hour. We love your laid back, comfy outfit. What’s your go-to daily uniform? I am obsessed with the brand Cotton Citizen. They make basics that last through a million washes. I’m usually wearing them head-to-toe all day long. Perks of working from home means comfy clothes most of the time! Snoozing. Not sure I can break this one, its been with me for a LONG time. Our living room is extremely comfortable and cozy. Having a non-leather couch was extremely important to me for both comfort and ethics. Reading a book unrelated to work. Fiction + Mystery are my favorite. I know I’m doing something right when I read a book or two a week.